This may well be the furthest East I have ever been, and I am pretty sure it is one of the tiredest, too. The last seven days have been full on as I make my way from the East coast of the world’s largest landmass, over to Sakhalin, one of Russia’s many islands in this part of the world. It has been full of ups and downs, long days and hours of pedalling and paddling, and a seemingly endless round of sorting kit, packing kit, unpacking it, sorting it again and repacking it and hours of phone calls on logistics and various aspects of the project. Both mind and body are working hard to keep all systems running and maintain the pace needed to hit Japan before the sea freezes over. Indeed, I am now trying to quicken the pace after various hurdles have sprung up in the stream of contingencies which stand in my way, shortening the window of opportunity. Back in the boat I was more than a little bit nervous about getting back in Nelson, worried that I might have forgotten skills and that my muscles might not be up to the challenge. What a challenge it was, too. While it was lovely to be back on the water in some ways and fun to be paddling with Justine again, my mind and body were pretty shocked by the whole thing and it took a few days to feel comfortable again. In my enthusiasm and naivety of planning I think I underestimated what it would take to make the switch for this phase. 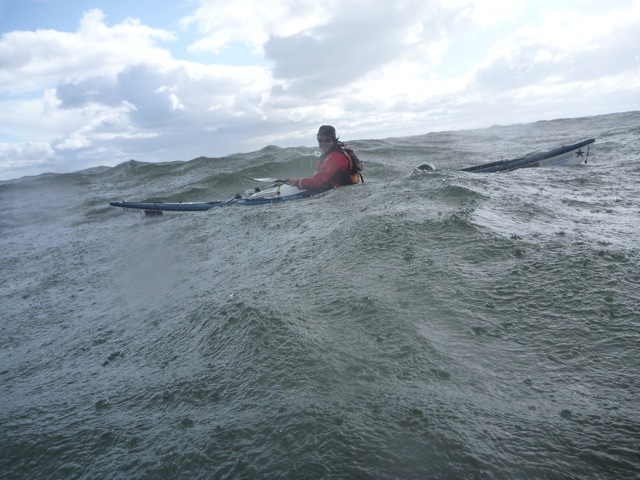 One day I was cycling, as I had been for the last six months, and the next I was paddling. 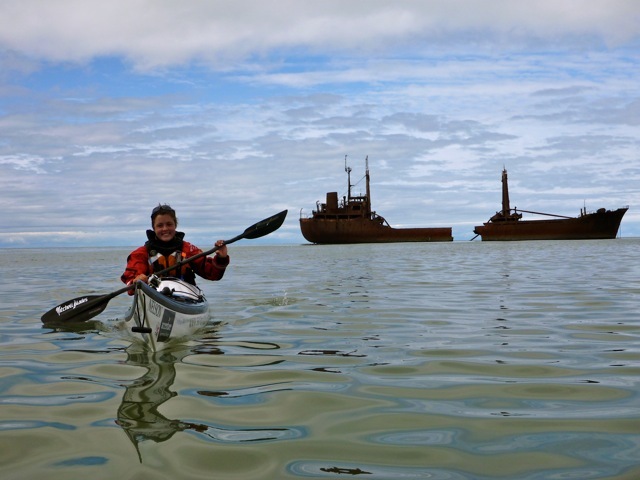 Given that the most challenging crossing of this leg is still to come (La Perouse Strait between Sakhalin and Japan), I am glad for the reintroduction to paddling life that this last few days has offered. 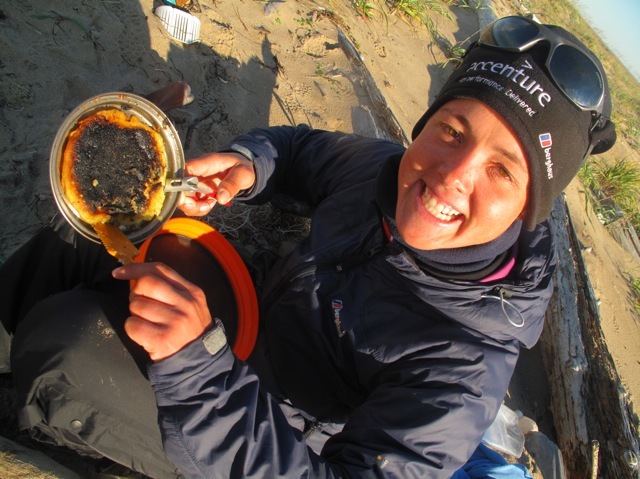 Four long days of paddling in a variety of conditions, including a big crossing, has given me allsorts of things – some great and lovely and some not so welcome. The knotted muscles and blisters could have stayed at home, but the revision lesson and confidence boost were perfect, and the peace and smiles which came from spending a few days in some beautiful places and paddling with Justine have been great. Oh, and happy days! A real rest day, too, when we were weather bound by the tail end of a typhoon. The extra sleep was glorious and the lack of communication equipment meant that the To Do List had to wait. For the first time in months I could really relax, if only for a day. My favourite day was the final journey we made down the coast to Tanghi (sic), our kayaks slicing through glassy calm seas as we hugged the low coast, watched by lazy seals dozing in the sunshine and quizzed by a few wide-eyed fishermen in little boats, goading at the size of their expected catch, their arms widening all the time. A few tiny wooden villages perched at the edge of the sea, grey and brown boxes set against a vibrant green background of thick forest and framed by blue skies and seas. It was easy to see that this is a harsh and unforgiving environment – stunted trees grow a shocked crown at angles to norm, as though screaming Eastward with the wind, and giant logs lie in awkward places high up the beach and shoved into rocky gaps like graffiti after a storm. Then there are the ships wrecks, gentle giants rusting quietly as they wait for forever to arrive and swallow them into the sand. It is a wild and curious place up there and my only regret is that it was a fleeting visit. Tempus fugit and so must I. Sarah & Hercules (now sporting a new bottom bracket) x PS Thanks again to DHL for their part in getting Nelson out to me. Heroes. PPS The next couple of weeks are set to be huge, so if I go quiet for a bit, this is why, I need all the mental and physical oomph I can muster to get to Japan in one piece. PPPS Thanks to Vladimir and Igor for their logistical support and everyone in De Kastri who helped us out. 24 Responses to Notes from a small island. Wishing you calm seas and strong paddling as you cross to Japan. Beautiful, beautiful, beautiful. A set of tiger-branded chopsticks being clicked together in your honour. Japan awaits you Sarah, in one piece please! I so agree, a beautifully written blog – we are so understanding your next few weeks of mental and physical oomph Sarah … so love is sent to you with total support, to wish you all the extra energy and power we know you will find, to see you into Japan. Striking pictures! I just showed them to my wife, Louise, and bunches of ooo’s and ahhh’s. Maybe I missed it, but how far of a paddle is it from Sakhalin to Japan? Can’t wait to see the pictures from that part of the trip! The Baldwin family is pulling and praying for you guys! The crossing from Sakhalin to Hokkaido, Japan’s northernmost island, is around 25 nautical miles in a straight line. It’s complicated, however, by tricky currents which will increase the actual distance paddled as well as making it harder work. 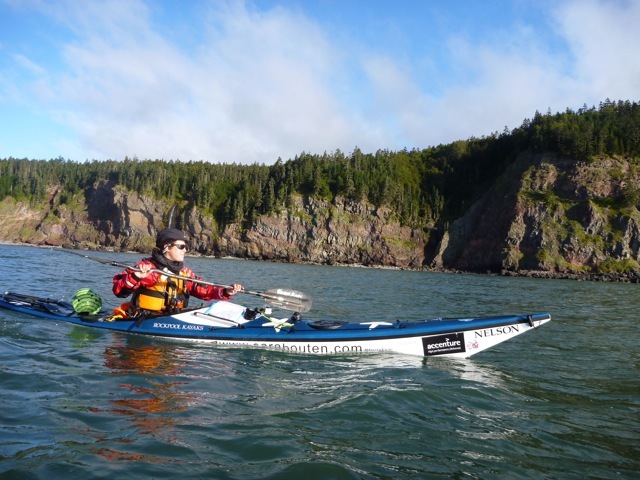 Additionally, due to the difficult rules around the Russian border, Sarah and Justine may have to be dropped off some way from the coast and thus kayak even further. Beautiful images and words .. you so put all “to do” lists in perspective! I love the insights you share into fine tuning adventure instincts and peak physical and mental attitude for navigating seas and territories of every description. Wishing you a safe transition to Japan and a comfortable adaptation back to ocean life. 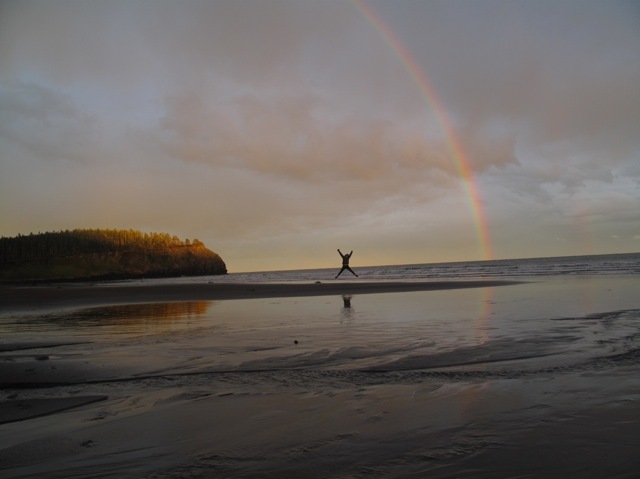 Not a surprise to see you (Sarah) in the beautiful pic at the end of a rainbow…. As you are GOLDEN!!! Keep up your spirits as you inspire the world. We are all out here rooting for you!!! 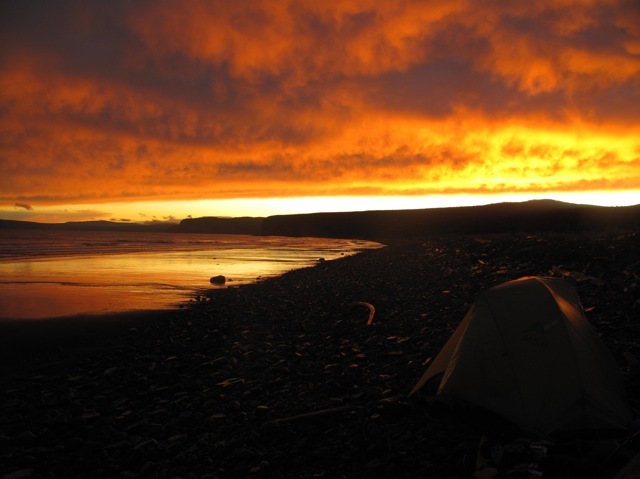 I wholeheartedly agree with Alastair – fantastic photos – the light and the colours in the sky are tremendous. Shame about the pancakes!!! Fantastic photos Sarah. That lumpy sea looks like it’s made from something solid! 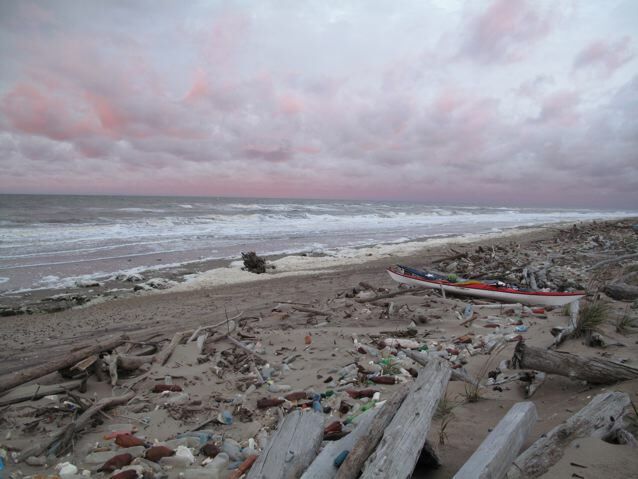 Man that’s one untidy beach – hope you had lots of bin bags lol! You are an amazing creature. Stay safe. Sending you lots of positive energy and girl power! Go Sarah!! Hi Sarah, All of us at Sailability have been following your progress and we’re all cheering for you. Proud to know you and look forward to following your progress on the next leg. Hi Sarah – greetings from from all of us at Rutland Sailability we’re all cheering for you well done. Great pictures what an incredible adventure. Looking forward to following your progress on the next leg. How are the Mars Bars holding out?